Recombinant Pig erythropoietin (PPP021) detected using Rabbit anti Pig erythropoietin (AHP2389) as the capture reagent and biotinylated Rabbit anti Pig erythropoietin (AHP2389B) as the detection reagent followed by Streptavidin:HRP. 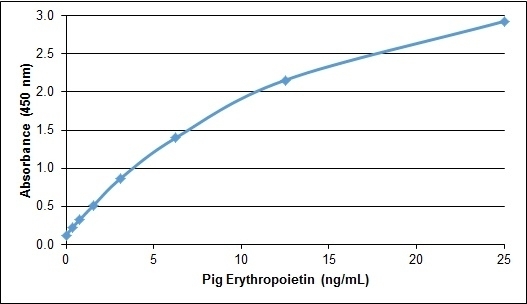 Recombinant Pig erythropoietin is an 18.6 kDa recombinant protein corresponding to aa 27 - 194 of native porcine erythropoietin (EPO). Erythropoietin, commonly known as EPO or hematopoietin, is a secreted protein belonging to the EPO/TPO family and involved in erythrocyte regulation. Erythropoietin is a hormone secreted from, in adult mammals, primarily the kidney but to a lesser extent the liver. In the fetus, EPO is secreted from the liver. EPO functions as a regulatory cytokine in the differentiation of erythrocytes. This reagent may be used as a standard in a sandwich ELISA assay in conjunction with AHP2389 as a coating antibody and AHP2389B as a detection antibody.